PR is a powerful tool, but just like starting a business where you need a strategic plan and a marketing plan, one needs a PR Plan as well. PR can open many doors for you and your business. Robbie Motter has been doing PR for clients across the country for over 2o years. Helping YOU become a master in doing YOUR PR is one of her passions. Come and join Robbie on Sunday June 26th from 2pm to 5pm at the Hillside Mobilhome Park Clubhouse, 27701 Murrieta Road, Menifee, CA 92586 The cost for this class is only $20.00. 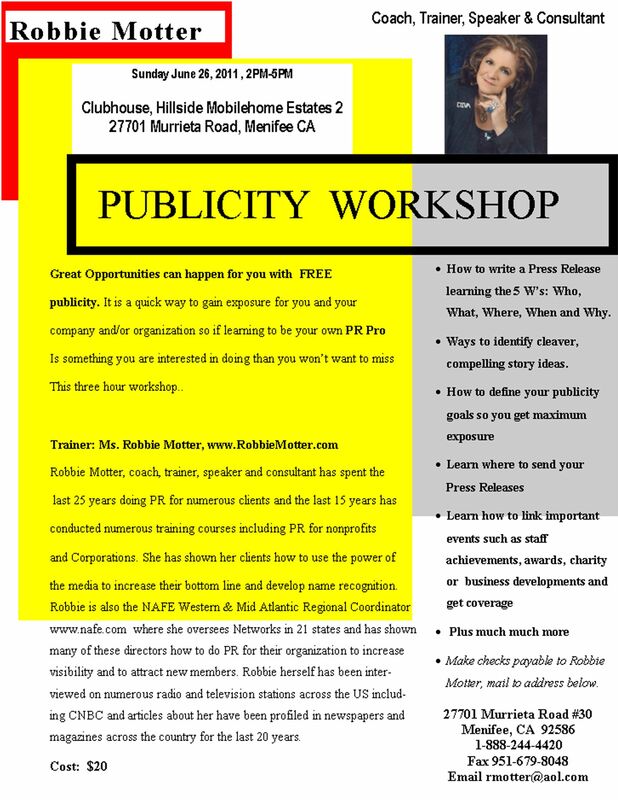 Some of the things Robbie will teach you in this class is: Why is exposing yourself using the Power of the Media important to you and/or your business? She will cover: What is PR, and WHY should YOU do it? How does one get started? How do YOU bend a news reporters ear? What are Community Calendars and how can they help YOU? Do's and Don'ts on doing a Press Release What are the Five W's Where and How Do you distribute a Press Release? How does Timing Fit in? What happens when YOU get a News Conference and What do YOU Need to know? What about Talk Shows? What about Radio & TV Editorials? Producing Your Own Program, what's out there? What are some tips for Talking to Reporters, Editors What are Public Service Announcements, and who qualifies for them. How do you respond to Unfair or Inaccurate Coverage? What are some strategies for Media Access? Why is building good Media Relations important? 15 things Media Hates! 15 things Media Loves! What opportunities for media exist on line, i.e. blogs, articles, interviews. and more You must RSVP for this class to Robbie Motter at 888-244-4420 or email rmotter@aol.com, you can also invite friends, men and women are both invited.